The CMP10, manufactured by Kipp & Zonen, is an ISO secondary standard pyranometer that monitors solar radiation for the full solar spectrum range. It connects directly to a Campbell Scientific data logger and is well-suited for meteorological networks and solar-energy research and development. 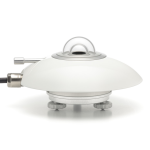 The CMP10 measures solar radiation with a high-quality blackened thermopile protected by two glass domes. Its flat spectral sensitivity, from 285 to 2800 nm, makes it ideal for applications in natural sunlight, under plant canopies, in greenhouses or buildings, and inverted to measure reflected solar radiation. An internal drying cartridge prevents dew from forming on the inner sides of the CMP10's domes. 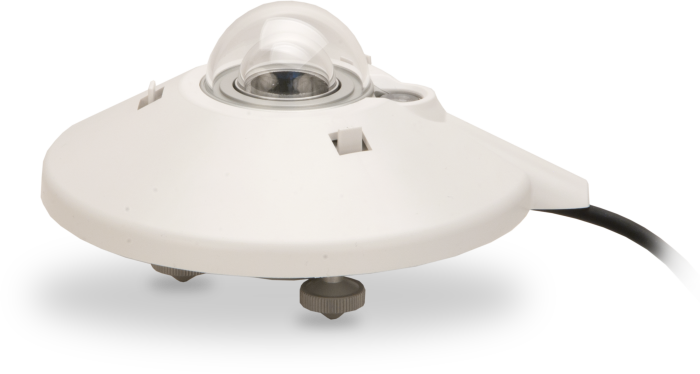 Campbell Scientific also offers the CVF4 heater/ventilator that keeps its domes free from ice and dew. The CMP10 includes a white snap-on sun shield that reduces the sensor's temperature. A bubble level and adjusting leveling screws enable the sensor to be leveled without using a leveling base. The CMP10 produces a millivolt signal that is measured directly by a Campbell Scientific data logger. The CMP10 has a bubble level and two leveling feet, which allow it to be leveled without using a leveling base. This pyranometer mounts to a mast, crossarm, or pole (1.0 in. to 2.1 in. OD) via the CM255 or CM255LS mounting stand. The CMP10 should be mounted away from all obstructions and reflective surfaces that might adversely affect the measurement.